Petty Officer Acoustic Warfare Analyst - Submarines Benjamin Smith helps Stella Holt, Year 6 student from St Francis of Assisi Primary School (Paddington), attach her message in a bottle onto HMAS Onslow at the Australian National Maritime Museum, Darling Harbour, Sydney. Picture ABIS Tom Gibson - Navy Imagery Unit - East . Celebrations to mark the centenary of Australian submarines were officially launched today (7.2.2014) by Defence Minister Senator David Johnston in Darling Harbour. After the launch the Minister joined children from St Francis of Assisi school to write messages of hope in bottles which they hung on the submarine HMAS Onslow at the National Maritime Museum at Darling Harbour. A range of events has been announced to recognise and celebrate Australia’s submarine centenary including the commemoration of the nation’s first submarine loss – the AE1, sunk with all hands in May 1914 off the coast on Papua New Guinea. Children from St Francis of Assisi Primary School write messages of hope in bottles, which they hung on the decommissioned submarine HMAS Onslow at the National Maritime Museum, Sydney. Picture by ABIS Jesse Rhynard - Navy Imagery Unit - East. Director General Submarine Capability, Commodore Peter Scott, CSC, RAN joined the Minister for Defence, the Hon David Johnston MP at the Centenary of Submarines launch, hosted by the Submarine Institute Australia (SIA) and Submarine Association Australia (SAA) at the Australian National Maritime Museum. At the launch, the Royal Australian Navy Band performed a new arrangement of the 'Silent Service.' Picture - RAN Media. 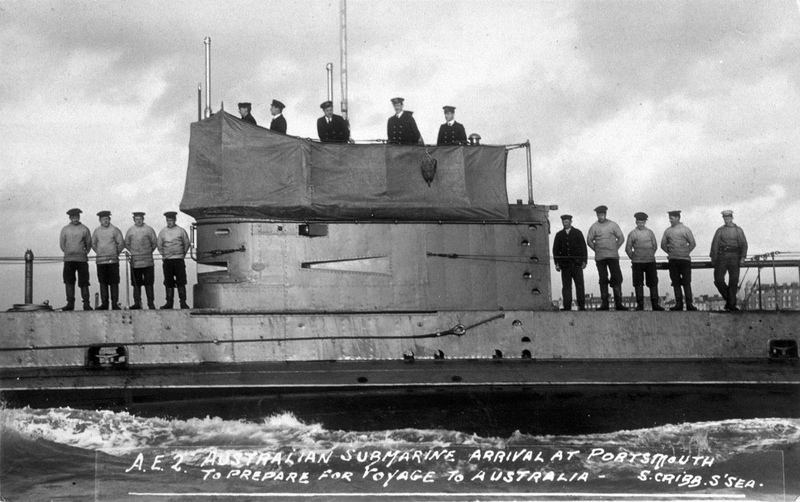 Photograph of the Australian submarine AE2 with crew on deck at Portsmouth, 1914. Inscription reads `A.E.2 Australian submarine arrival at Portsmouth/ to prepare for voyage to Australia - S.Cribb.S'sea'. AE2 was the first submarine to penetrate the Dardanelles Strait. From 25 April to 30 April, 1915, it played a hectic game of cat and mouse with Ottoman forces causing confusion and raising alarm by creating the illusion that other Allied vessels had penetrated the Strait. AE2 was eventually sunk by its commanding officer to avoid capture and the crew spent the next three and half years as prisoners of war in Turkey during which time three of them died. Object no. 00015862, courtesy of the Australian National Maritime Musuem. 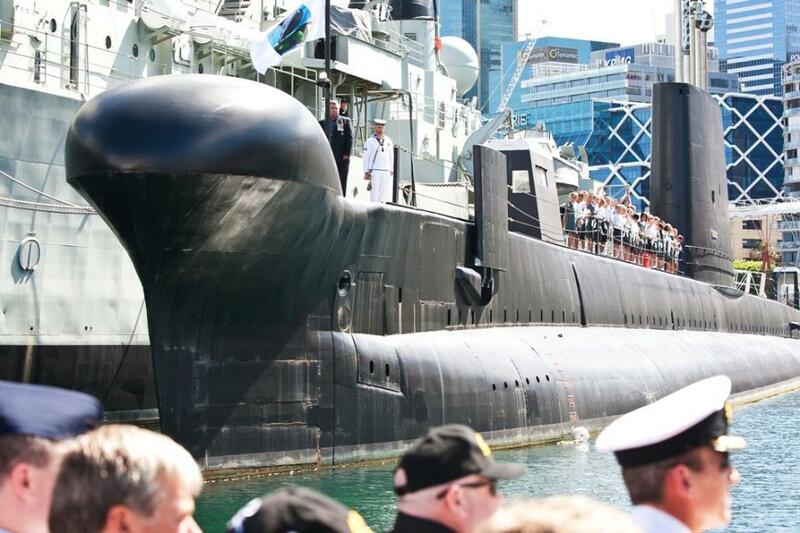 2014 marks 100 years since the submarines AE1 and AE2 entered service with the Royal Australian Navy. These submarines were built in Britain and arrived in Australia in 1914. Following the outbreak of World War I, both boats took part in the occupation of Rabaul in German New Guinea in September 1914. During this operation, AE1 disappeared on 14 September off Cape Gazelle, New Britain. It is probable that she was wrecked on a reef during a practice dive, although as of 2008 she is yet to be found. HMAS AE2 - AE2 remained in the South Pacific until December 1914, when she was ordered to the Mediterranean to support the British-led operations off the Galipoli peninsula in Turkey. AE2was the first British submarine to penetrate the Dardanelles, achieving this task on 25 April 1915. AE2 operated in the Sea of Marmora for five days and made four unsuccessful attacks on Turkish ships before being damaged by a Turkish gunboat and scuttled by her crew on 30 April. These attacks are the only occasions an Australian submarine has fired in anger. The diving bell is one of the earliest types of equipment for underwater work and exploration. Its use was first described by Aristotle in the 4th century BC: "...they enable the divers to respire equally well by letting down a cauldron, for this does not fill with water, but retains the air, for it is forced straight down into the water." According to Roger Bacon, Alexander the Great explored the Mediterranean on the authority of Ethicus the astronomer. In 1535,Guglielmo de Lorena created and used what is considered to be the first modern diving bell. Right: 16th century Islamic painting ofAlexander the Great lowered in a glass diving bell. Artist unknown, credit: OAR/National Undersea Research Program (NURP); "Seas, Maps and Men"
Submarine Plongeur under tug, 1863 print. The Australian submarine service was reformed in 1919, when the British government transferred six J Class submarines to Australia; HMA SubmarinesJ1, J2, J3, J4, J5, and J7. These submarines arrived in Australia with their tenderHMAS Platypus in April 1919 and were based at Osborne House, Geelong from early 1920. The boats were in poor mechanical condition, however, and spent most of their service in refit. Due to Australia's worsening economic situation, all five boats were decommissioned in 1922, and were scuttled later in the decade. The Australian submarine service was established a third time in 1927, when the British O Class submarines HMAS Oxley and HMAS Otway were commissioned. These submarines sailed from Portsmouth for Sydney on 8 February 1928, but did not arrive in Australia until 14 February 1929; numerous mechanical problems delayed their delivery voyage. Due toAustralia's poor economic situation, the O Class boats proved to be unaffordable and were placed in reserve in 1930, before transferring back to the Royal Navy in 1931. As a result, the Royal Australian Navy did not operate any submarines during World War II, though the obsolete Dutch submarine K.IX was commissioned as HMAS K9 22 June 1943 and 31 March 1944 and used for anti-submarine warfaretraining purposes. The Australian ports of Fremantle and Brisbane were important bases for Allied submarines during World War II. A total of 122 United States Navy, 31 Royal Navy, and 11 Royal Netherlands Navy submarines conducted patrols from Australian bases between 1942 and 1945. Fremantle was the second largest Allied submarine base in the Pacific Theatre afterPearl Harbor, Hawaii. Following World War II the Royal Navy's 4th Submarine Flotilla was based in Sydney from 1949 until 1969. The flotilla, which varied in size between two and three boats, was used to support the Royal Australian Navy and Royal New Zealand Navy in anti-submarine warfare training, with the operating cost split between the two nations. In the early 1960s, the British Government advised the Australian Government that reductions in the Royal Navy conventional submarine force meant that the 4th Flotilla was to return to the United Kingdom. The impending withdrawal of the British submarine flotilla sparked the fourth attempt to establish an Australian submarine service. While the Department of Defence advised the government that three to six submarines should be purchased for training purposes, following the intervention of then-Senator John Gorton the Government instead approved the purchase of eight submarines to form a submarine strike force. Eight British Oberon class submarines were ordered in 1964, to be built in Scotland in two batches of four boats. Only six boats were delivered; the seventh and eighth were cancelled in 1971 to fund the acquisition of ten A-4 Skyhawk aircraft for the Fleet Air Arm. The first Australian Oberon class submarine, HMAS Oxley, was commissioned on 21 March 1967. She was followed by her sister ships; Otway (1968), Ovens (1969), Onslow (1969),Orion (1977), and Otama (1978). Orion and Otama were more capable than the previous four boats, as they were fitted with advanced communications monitoring equipment. All of the Oberon class submarines were based at HMAS Platypus, on Sydney Harbour. The Oberons proved very successful and saw extensive service during the last decades of the Cold War. This service included conducting risky surveillance missions against India and Communist nations in South East Asia. These missions were cancelled in 1992 when an Australian submarine, believed to be Otama, became tangled in fishing nets and was forced to surface in the South China Sea. As part of the Government's Two Ocean Navy policy submarines were homeported at HMAS Stirling in West Australia from 1987 and the headquarters of the Australian Submarine Squadron moved to HMAS Stirling in 1994.The Oberon class boats were gradually decommissioned and replaced with new Collins class submarines during the 1990s. The final Oberon class boat, HMAS Otama, was decommissioned on 15 December 2000. The six Collins class submarines were the first Australian-built submarines, and the most expensive ships to have been built in Australia. The Collins class submarines were built by the Australian Submarine Corporation at Adelaide, South Australia and entered service between 1996 and 2003 following extensive trials and modifications to the early boats in the class. The dedicated trials and submarine rescue ship HMAS Protector supported these trials between 1992 and 1998. Tests conducted on HMAS Collins after she was provisionally commissioned in 1996 revealed serious shortcomings in the submarine's performance, including excessive hull noise and an ineffective combat system. These problems were subsequently rectified and the Collins class submarines currently rank among the most effective conventional submarines in the world. Like the Oberon class, the Collins class submarines have conducted surveillance patrols. These patrols have included collecting intelligence on East Timor ahead of the Australian-led intervention into the then-Indonesian province in 1999. While the Collins class submarines' performance has improved over time, their maximum diving depth was permanently reduced following the near-loss ofHMAS Dechaineux when a pipe burst during a practice dive in February 2003. In 1998 the Royal Australian Navy became the fourth Navy in the world to permit women to serve onboard submarines. The first female submariners began their training at the Submarine Training and Systems Centre in June 1998. The Royal Australian Navy Submarine Force Element Group Headquarters, and all six of theCollins Class submarines, are at HMAS Stirling located in Rockingham, Western Australia. The majority of the Navy's submarine support facilities are also located at HMAS Stirling, including the Submarine Escape Training Facility. The LR5 submersible, which is contracted to provide the RAN's submarine rescue capability, has been based at nearby Henderson, Western Australia since June 2009. In early 2007, it was reported that Submarine Service was experiencing severe shortfalls in personnel and had only 70% of its authorised strength of 500 sailors. These shortfalls were reported to have reduced the service's operational readiness and forced HMAS Collins to be temporarily withdrawn from service. Collins class submarine replacement project - The Collins class submarines will begin to reach the end of their useful life from 2026. In order to meet the in-service date of 2026, advanced design work on the next generation of Australian submarines will begin by 2014–15. At this very early stage, it appears probable that the submarines will be Australian-built conventional submarines equipped with air independent propulsion and advanced combat and communications systems. In December 2007 the Australian Government authorised the Navy to begin planning for the Collins class' replacement. The Navy will research options for the submarines and will report back to the government in 2011. The contract for the new boats is planned to be signed in 2014 or 2015 with the first new submarine entering service in 2025. It is expected that the submarines will be built by ASC in Adelaide. 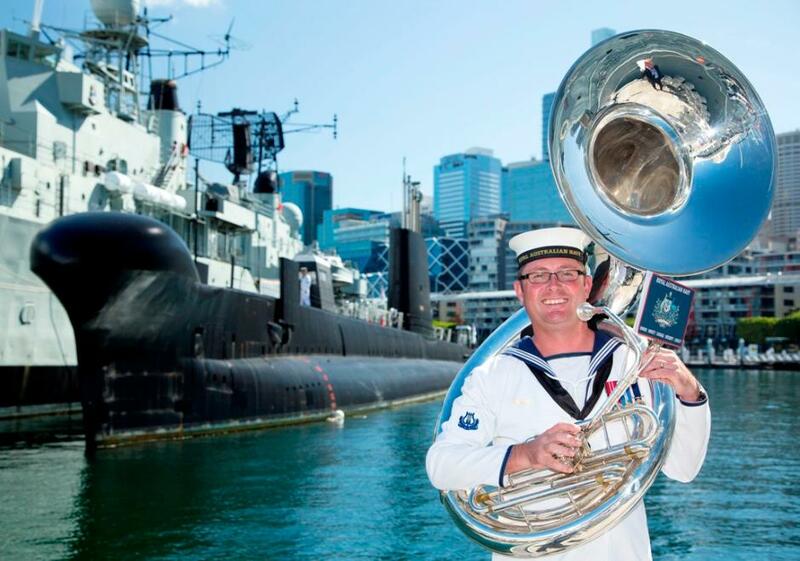 Musician Leading Seaman Martyn Hancock who composed the musical piece "March of the Silent Service" stands in front of decommissioned submarine HMAS Onslow at the Australian National Maritime Museum, Darling Harbour, Sydney. Picture by ABIS Tom Gibson - Navy Imagery Unit - East ..